Truckload of beer involved in Cedar Rapids crash. 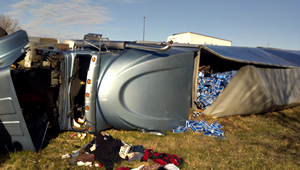 A truckload of beer that tipped over caused some problems this morning in Cedar Rapids. A spokesman with the Cedar Rapids Fire Department says a semi driven by 36-year-old Travis Dicks of Colfax, Wisconsin went of the Highway 30 ramp of Insterstate 380 and rolled over. The truck was carrying 45,000 pounds of Bud Light, some of which spilled out of a break in the truck’s trailer. The driver was not injured in the accident.